How often do you tell your kids to get away from the video games, television or other electronic devices? I like activities where my kids use their minds to create something imaginative. When kids develop their creativity I feel that they are more adept at learning in school. This holiday season why don't you give the kids the gift of creativity with Kelly Kits. These kits are more than just a simple coloring book. From painting, collage, sculpting and more, the Kelly Kit offers the kids a way to express their wildest imagination in art. From the scary monsters lurking under the bed to the limitless depths of space, the kids can formulate any of their heart's desires. The orginial Kelly Kit contains the following, one set of five unique activities that cover the five art disciplines: painting, drawing, sculpting, printmaking, & collage. Each kit contains all of the arts and crafts tools & materials needed for the activities. These activities are best completed in a kitchen (for any potential mess clean-up). For parents who aren't the creative type (like me), the activity does come with an instruction card to help guide the kids in the activity. My kids love their art class at school. I will have a few of these kits on hand over the holiday break so that we can keep the creative juices flowing. Vacation can't be spent entirely on a couch. 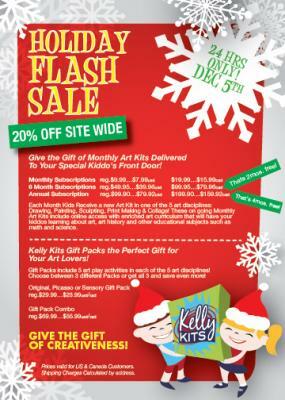 Be sure to check out the Kelly Kit website for lots of holiday specials. Disclosure: I wrote this post as part of a promotion. All opinions are mine.